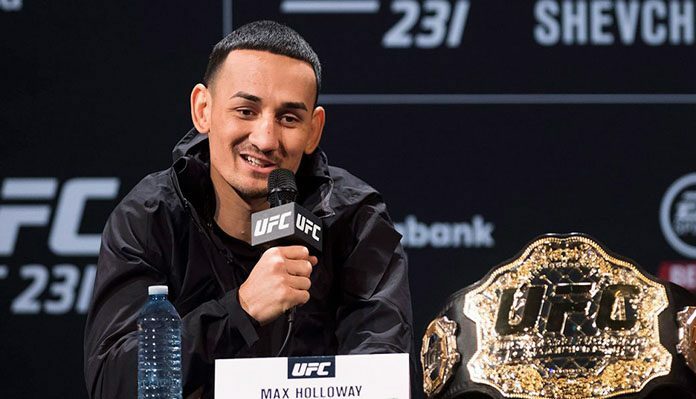 At UFC 236, which goes down on April 13 in Atlanta, Georgia, UFC featherweight champion Max Holloway will hike up to the lightweight division to battle streaking contender Dustin Poirier for the division’s interim title. Given that Holloway has always endured a pretty significant weight cut down to the featherweight division, some fans have wondered if this move up to lightweight could be permanent. That being said, it sounds as though Holloway plans to return to the featherweight division — perhaps even as soon as this summer. While it sounds as though Max Holloway still has ambition to defend his featherweight strap, he also made it clear that he intends to send a message to undisputed lightweight champion Khabib Nurmagomedov with a victory over Poirier. What do you think the future holds for the featherweight king Max Holloway? Join the conversation in the comments section. This article first appeared on BJPENN.COM on 3/6/2019.